Merry Christmas & happy holidays from the Sontakeys! You two are such a beautiful couple. You look stunning in this gorgeous red dress. Merry Christmas! You look stunning Shveta! Merry Christmas! Merry Christmas! You are the most gorgeous pregnant woman ever! This red dress with the slit and your heels is beautiful! You look so stunning, the whole outfit ensemble is just perfect! Anyway, would you like to follow each other on Google Friend connect and google+? Wow! What a gorgeous photos. Beautiful Couple! You look incredible. Eveyrthing about your outfit is perfect. These photos are incredibly beautiful!You look stunning in that red dress! Merry Christams and happy new year! Such gorgeous photos! I hope you had a lovely Christmas! Such beautiful photos!! Love your red dress!! So much love on those pictures! love it! Your dress is beautiful! I love the color. So perfect for the holidays. You look fantastic! Love these beautiful photos, and that stunning red dress. I hope you had a Merry Christmas! You look so stunning! Happy Holidays! You two are such beautiful couple. Happy holidays! Great photos! Your dress is beautiful! You are absolutely STUNNING! Your little family is so perfect. Happy holidays! WOW!!!! You are Stunning!!! Such perfect photos! Lovely photos and lovely family! Love your beautiful dress! Hope you had amazing Christmas!! Such a gorgeous couple!!! Happy holidays. I hope I look this put together and glamorous when I’m pregnant #goals. You look absolutely beautiful, Shveta; such a lovely couple you both are! I wish you and yours a very Merry Christmas and and New Years, as well! Picture perfect scene! 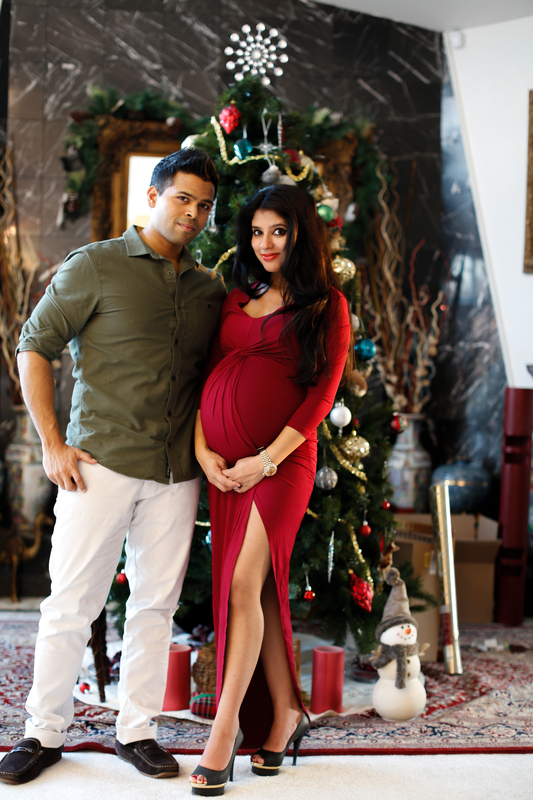 I adore this Revolve red dress on you and you two make a beautiful couple together You must be getting so excited now for your little one to arrive! Hope you had a wonderful Christmas, Shveta! You guys look adorable! So pretty! I hope you and your family had a blessed Holiday Season! Much love! Gorgeous red dress. I like that even though it’s a summer weight jersey knit, you can still wear it now during this season. Not to mention it looks incredible comfy. Such cute photos, and you look gorgeous in red. Happy Holidays! Gorgeous photos, lady! You guys look so festive + happy! Wishing you happy holidays and all the best in new year! You are very beautiful family! Happy holidays and wishing you the happiest new year, gorgeous! You look beautiful! Such cute photos! You have such a beautiful family! Happy New Year! You look amazing ! have a fabulous new years !! Happy New Year! Amazing pictures! Amazing pics babe. That red dress look stunning on you. I wish you an incredible 2016 full of health, love and success… And lots of travel! HAppy Holidays and Happy New year sweets. You are glowing by the minute the dress looks so hawt on you and still so comfy…Have an awesome year ahead. You guys look so beautiful!! Wish you all the best in 2016!! Beautiful photos! Wishing you a very happy New Year! You both look so lovely! Have a happy 2016! Dear Shveta! I’m wishing you, your husband and to the one who adds sunshine to your family a very happy and healthy new year! You both look amazing dear! Awww these photos are sooo beautiful!!! what a lovely family! Happy New Year to you too! You’re looking absolutely beautiful and your husband couldn’t be any cuter! What a stunning outfit. And beautiful couple. Hope you had a great time during the Xmas holidays!